Sadly, Murray no longer exists as a high school. William Pitt Murray was the president of the Minnesota Constitutional Convention in 1857 and later the author of the St. Paul City Charter. The first Murray School named for him was an elementary school which opened in January 1888 at Como and Commonwealth. The school originally had four rooms. Miss Emma Cooper was the first teacher and the school had nine pupils. Four more rooms were added later. 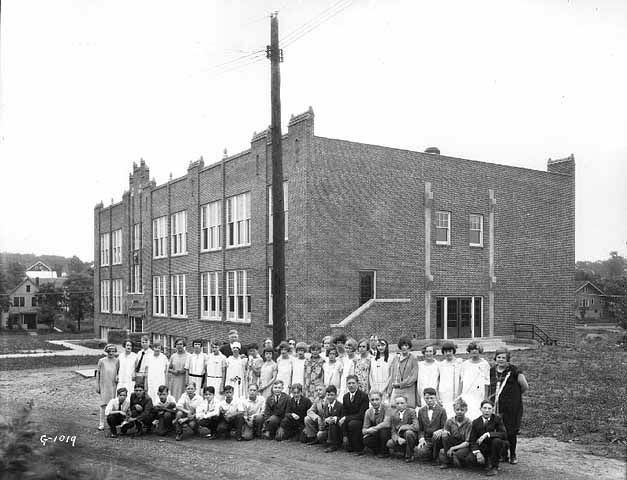 In 1925, a new school was built at Buford and Grantham with 13 classrooms and a gym and the Murray name was transferred to the school. Grades K-3 and 7-9 moved to the Buford site; grades 4-6 remained at the Como Avenue school which was renamed Gutterson School, after Gilbert Guttersen, a prominent local businessman in St. Anthony Park. Mr. Ezra R. Edwards was the principal of the new Murray school which opened in 1926. In 1930, a section to the south was added to Murray almost doubling the size of the school. Then the school transitioned to a junior -senior high and the remaining elementary students were transferred to Gutterson. Murray added sophomores in 1937 and juniors in 1938. By September 1939, Murray had an enrollment of 822 students in grades 7 through 12 with H. E. Hillard as the principal. An auditorium wing was completed in December 1939 which included a typing room behind the auditorium balcony and science rooms on the lower level. The first class of 113 seniors graduated in June of 1940. They published “The Pilot” the school’s first yearbook—a copy of which is still on file at Murray. In 1963 there were 1100 students enrolled, and Murray was very overcrowded and had double shifts. Murray needed more space. A new building was constructed to the west, housing a large gym and pool, music rooms with tiered seating, a home economics room and laboratory science facilities. Then in 1978, a new library (Bulger Library) was built, adding another walkway between the old and new sections of the school. A final physical change came in April of 2000 when a new front entrance with 13 offices for staff opened. The last high school senior class graduated in June 1979. For the 1979-1980 school year, Murray was an open enrollment magnet junior high for grades 7-8-9. In 1980 Murray became a grade 7-8 Junior High School, and in 1986 a Science-Math Magnet school with an average student population of 800 students. In 2013-14 6th graders joined Murray and it will become a middle school. Look at the 1940 List of Students and see if you see any familiar names. The students of class 1969 saw a decade of gut-wrenching change, moving from ‘American Graffiti’ through ‘Strawberry Fields Forever’ and ‘Abraham, Martin, and John’, then finishing the decade with the Moon Landing and the Woodstock Music Festival.